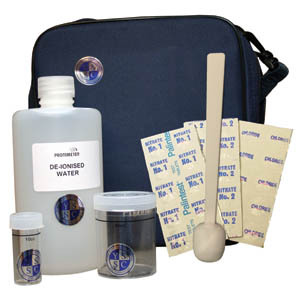 Check for hygroscopic salts contamination - nitrates and chlorides. Take small plaster sample from surface of area under investigation. Mix with distilled water in two separate pots. Add reagent capsules for chlorides and nitrates respectively; colour change denotes relative concentration of chloride/nitrate contamination. High (relative) level of both nitrates and chlorides indicates rising dampness as soil-bound water contains both.